Lightweight, sturdy and effective. 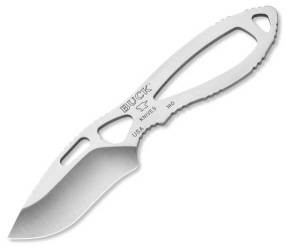 This skinning knife can be carried alone or used to compliment any hunting knife. The skeletal steel frame is heavy-duty, yet lightweight enough for easy carry. You wonâ€™t even know itâ€™s there. The 420HC steel blade ensures durability and corrosion resistance, while the minimalist design is effective and reliable while in use.